We’ve had a winter storm here for the past few days and have really snuggled in. Grilled cheese and tomato soup have fit the bill for lunch. 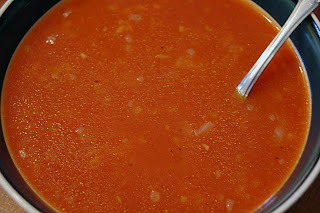 This recipe is a great way to dress up a can of tomato soup. Please note: the recipe calls for celery, but I didn’t have any on hand. It tasted good without the celery, but is a little better with it. Saute the onion and celery in the butter until it’s tender, but not browned. Add the remaining ingredients and heat through. Stay warm! Mmm, cooking without actually having to do much cooking. Love it! This looks great – simple, healthy and delicious! 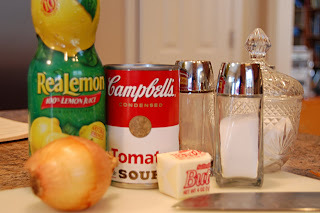 I’ve never like tomato soup from a can…maybe this could change my mind. Mmmm, grilled cheese and tomato soup sounds so good! Such a warm and toasty meal for the cold weather! Too bad I used up my cheese yesterday! Darn!!! Sounds yum! If it wasn’t so hot here today (around 112) I’d be tempted!! Great idea for a cold winters day and so easy too!! Looks so comforting. sounds really good! I was looking for a new way to do tomato soup…and you can’t beat grilled cheese sanwiches made with the Mexican blend grated cheese ..mmmm! Thanks for stopping by today. This looks so good. Got to give it a try! This soup was super delish! I added some basil & garlic salt as well and it was great!